Photo: Last week Kim Jong-un gave the first televised New Year’s Day message by a North Korean leader in 19 years. South Korea faces “final destruction” if Seoul and its allies continue to push for tougher UN resolutions against North Korea’s nuclear programme, Pyongyang warned Tuesday.”We have never recognised the propagandist resolutions on sanctions by the UN Security Council,” North Korean envoy Jon Yong Ryong told a session of the UN Conference on Disarmament. “As the saying goes, ‘a newborn puppy knows no fear of a tiger.’ South Korea’s erratic behaviour could only herald its final destruction,” he insisted. North and South Korea traditionally trade barbs at the UN forum — which meets regularly in Geneva and focusses on a raft of global arms-control issues. But in the wake of North Korea’s latest nuclear test last week and a global outpouring of condemnation, the rhetoric was unusually high-pitched Tuesday. South Korea’s ambassador, Kwon Haeryong, hit back. He said that Pyongyang’s secretive regime would do better to ensure a better life for its people, in a country which has suffered intermittent famines in the past two decades. “Everybody knows that North Korea is committing enormous resources to developing nuclear weapons and a missile capability. But it is very regrettable that a chronic food shortage persists and continually threatens people,” Kwon said. “Those Korean people are in a dire situation because of the bad allocation of their resources. The North Korean regime has continued to ask for humanitarian assistance from the international community. 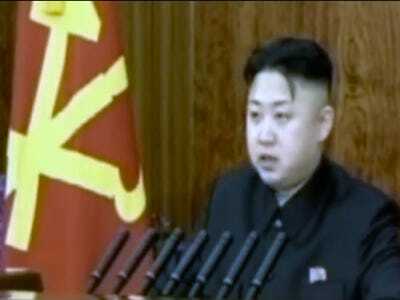 Considering this, we urge North Korea to focus on improving the living conditions for its entire people,” he said. Last week’s test was North Korea’s most powerful to date, with Pyongyang claiming a breakthrough with a “miniaturised” device. North Korea’s secretive regime repeatedly has rejected international calls to halt its nuclear programme, belittling international sanctions. Jon also slammed the United States, blaming the superpower for the current stand-off with his country — known officially as the Democratic People’s Republic of Korea, or DPRK. “The DPRK nuclear test is just a measure for self-defence, to cope with intensified US nuclear blackmail against it,” he said. “It is the disposition and firm will of the army and people of the DPRK to counter a high-handed policy with the toughest policy and react to pressure and sanctions with an all-out counter action,” he added. “The DPRK does not make any empty talk. It will take the toughest measure against foreign aggressors and violation of sovereignty in the future,” he insisted. The US ambassador, Laura Kennedy, said North Korea’s remarks would be “offensive and unacceptable” in any setting, let alone at a conference dedicated to disarmament.